Skill-based games tournament specialist WorldWinner has teamed up with Rovio to create an Angry Birds title specifically for competitive gaming. Angry Birds Champions invites players to enter competitions, pay a small entry fee, and then compete with others for the best score. The winner will receive a cash prize. It's the latest project from WorldWinner, a division of GSN Games, which operates a number of cash tournaments - primarily desktop browser games such as Tetris Burst, Bejeweled and Scrabble. The company is approaching 20 years, and is now attempting to push into mobile gaming, which included the arrival of the WorldWinner iOS app last summer. "We didn't want to just port the most popular games on the WorldWinner website," explains Jeremy Shea, SVP and general manager of Skill Games at GSN. "We wanted to look for the best-in-class mobile games that have already been released. And obviously Angry Birds came to the top of that list." He continues: "Our core focus has been iOS. We have not created an Android-based app, which obviously makes us unavailable to a large proportion of mobile gamers. But we are pleased with it. And we have taken the first six months since the app launched to refine the experience and optimise all the key things - from the way users select their games, and experience it, to how we brand it. And it was really to prepare us for this week. We knew we were going live with six or seven games, many of which were successful WorldWinner titles on desktop. But we really believe that this week, as we launch and publicise Angry Birds, that this was really the key milestone in this app development. "We will certainly use this to drive our future roadmap, and drive the level of energy behind getting the Android app to market." Desktop remains the primary market for WorldWinner, with just over a quarter of its users on mobile at the moment. However, the firm has placed mobile as its big growth area moving forward. "Our goal over the next couple of years is to take advantage of the fact that most people consume their games, or their entertainment, on mobile devices," Shea adds. "Our games can play on any device, so we are somewhat agnostic in terms of where people play. But we do think the native mobile app will offer a much better experience." 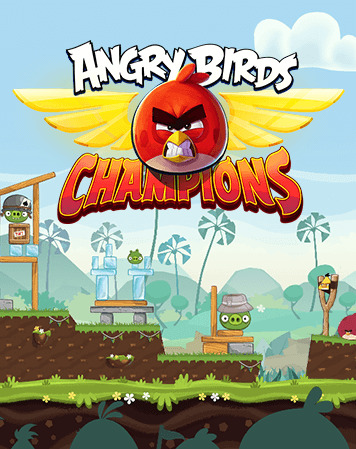 Angry Birds Champions is very similar to the Angry Birds game that players will be familiar with. However, the team at GSN has worked on the game to ensure the playing field is fair to all players - reducing elements of luck and chance. Yet Shea says that Angry Birds was already a very suitable game for the type of products that his team likes to work with. "We look for games that have a couple of different attributes. The first one is that it is inherently skill-based, and you can see that coming through with Angry Birds. As people play it more and they learn the subtleties of how the birds work and the different mechanics, you get better at it. That is different from non-skill based games where there are elements of chance and luck. We eliminate those. So when we look at games that we wanted to deploy in our mobile app, we decided this one was the natural fit. "The second thing is the variety of ways that you can play it. Every time you start a new competition, it is slightly different from your previous one. So it doesn't get boring or repetitive. Sure, there are certain things that are the same from game-to-game, but by and large you will have a different experience. So it is highly replayable. "Then third, there is the fun factor with this brand. You have the uniqueness in the gameplay, and the iconography, and the soundtrack... people can get really excited about it. But it is also the No.1 mobile game of all time." WorldWinner - with its cash-based element - is for over 18 players only. And although Shea acknowledges that Angry Birds appeals to kids, the brand clearly has a big broad audience that encapsulates its older target market. Naturally, there is concern when it comes to video games and real money, particularly in relation to protecting younger gamers. WorldWinner says it takes that seriously, and that many of the reservations around this type of competitive gaming has faded away over the years. "It is a different environment now compared with 15 years ago, when there were reservations about online financial transactions and people playing games generally as a form of entertainment," says Shea. "Today, we are very well regarded in the broader industry. Obviously that's why we can secure a licence as well regarded as Angry Birds, and we have numerous other licenses from Electronic Arts and Hasbro. I certainly feel today that we don't have any issues when we are at conferences, or speaking to potential licensors. Most of the time they are reaching out to us, because we are a different stream for their intellectual property to get monetised. "Obviously, WorldWinner has been in business for a long time. We have set the bar for skill-based gaming, certainly on desktop. We also have a much broader GSN games business, which is in a variety of different businesses, such as social casino and bingo. And then GSN games itself is owned by much larger parents in the form of Sony Pictures and AT&T. So we bring a lot of credibility to the conversation, and therefore any reservations that people have, we are able to quickly address those reservations and make them very comfortable." "I think there is a path that we could take that would make us fit more in that realm"
Another element that makes WorldWinner's model a little easier to digest today is the rise of esports. Although these skill-based cash tournaments are not exactly the same as esports competitions (Angry Birds Champions players, for instance, doesn't require people to play head-to-head. They can take their turns hours apart), it's not too far removed from what is going on in professional gaming. "We certainly pre-date what I would call the modern esports," Shea concludes. "At least in terms of the esports industry that evolved out of Korea. "We did one of the original live televised tournaments around 12 years ago, we gave away $1 million to players of solitaire and some of the Match-3 titles. So we always felt that we embody some of the things that the modern esports industry does. Although today our platform doesn't feature the viewership model or live audience that you get with Overwatch or League of Legends. "But there are people that consider themselves pros of this, and they make decent money and can win thousands of dollars. From that perspective, we always felt we were in the same space. Until recently, we never really said that we were esports, but rather we're kind-of a version of esports. And I think there is a path that we could take that would make us fit more in that realm. It is not our No.1 initiative. Our No.1 initiative is to build an audience and shift our existing audience to mobile. But we certainly describe ourselves in those terms."